After the invention of the printing press in the fifteenth century, the art of writing in manuscript took on fresh meaning. 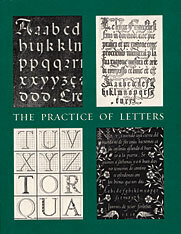 Printed manuals for the teaching of lettering and handwriting quickly appeared, marketed to a growing literate readership anxious to express humanistic values through fine writing. Mixing the aesthetics of calligraphy with innovative new means of printing, writing manuals thus reflect both the proliferation of print technology and the growing social value of a fine hand. Philip Hofer, Founding Curator of Printing and Graphic Arts at the Houghton Library, was long fascinated with the printed works of writing masters, and amassed one of the great collections of early penmanship textbooks before his death in 1984. David P. Becker’s catalogue tells the story of this collection while amply illustrating the diversity and expressive power of the arts of the pen.